54cm White Freestanding Cooker is rated 4.3 out of 5 by 7. 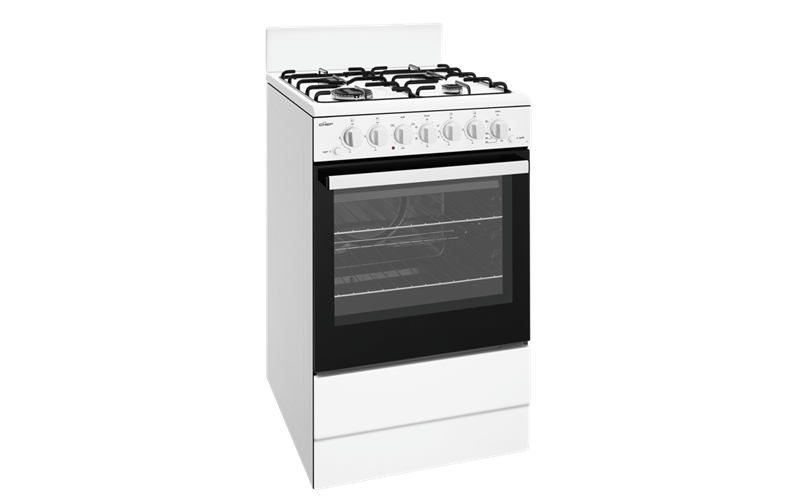 54cm White Freestanding cooker with conventional oven, timer, light, electric grill in oven, electronic ignition, and 4 burner gas hob. Rated 2 out of 5 by Maria E. from I didn't know that it's not fan forced oven. I thought fans are standard in oven. Also, the grill is electric powered when it says in the webiste it's gas fuel. Apparently, it's only the oven and cooktop that's gas fueld and grill is electric powered. I'm not happy with it. Rated 5 out of 5 by Patience from Purchesd freestanding gas oven for rental flat Purchased freestanding gas oven for rental flat living long distance from flat needed company to liaison with tenant outside working hours and remove, dispose old stove. As well as installation. All was easy done, Tenant is happy with stove though I have not used it. Rated 5 out of 5 by Anonymous from Rang company a few times to ask questions- very friendly and helpful, nothing a problem. Efficient delivery and oven as should be. Rated 5 out of 5 by Anonymous from It met all expectations and was substantially cheaper than through my local retailer. Very Happy. Rated 4 out of 5 by Anonymous from Mid range product ideal for rental home. No complaints from tenants. Rated 4 out of 5 by G Man from Good value Good cheap stove. would buy a fan forced next time.